Heya, folks! 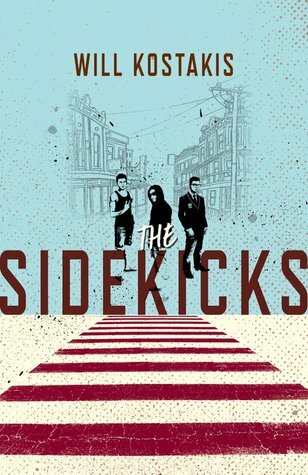 It was very cheering to see everyone so excited about last month’s title, and I hope you’re equally keen to get your teeth into this month’s book: THE SIDEKICKS by Will Kostakis. Will Kostakis’s first novel, Loathing Lola, was published when he was just nineteen. His second novel The First Third, won the 2014 Gold Inky and was shortlisted for the CBCA Book of the Year and the Prime Minister’s Literary Awards. A Sydney native, Will happens to be one of those unique writers who are just as eloquent, funny and smart in person as they are on the page – Will is a regular speaker in schools and at festivals and events, and has been a vocal supporter of #LoveOzYA. At last year’s Reading Matters conference, he spoke movingly about his experiences as a closeted teen and a queer writer. THE SIDEKICKS follows the perspectives of three very different teenagers – Ryan, Harley and Miles – after the death of Isaac, the fourth member of their friendship group. Isaac was the glue that kept the group together, and now grief is the thing that’s keeping them all tied. Reviews of the book describe how the boys’ ‘stories, pains and joys are all achingly relatable’ and the book is divided into three parts, with each part told through the eyes of a different character. I do hope you enjoy THE SIDEKICKS during May – remember that you can order the book through Boomerang Books, with free shipping by using the ‘loveoz’ code. I’ll be in touch again soon with news about any upcoming Facebook chats or author Q&A’s. Until then, have a good month!